Measurement of gene expression in vivo must take into consideration factors of single cell heterogeneity, multiple gene copies, and stochastic variation in promoter occupancy. 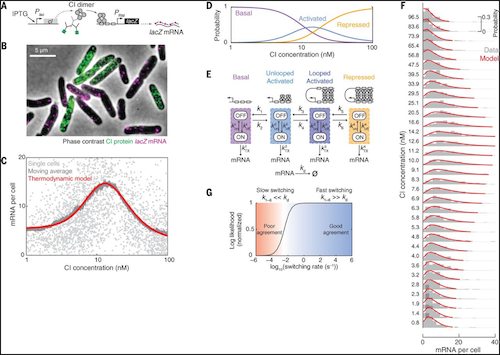 CPLC researcher I. Golding and colleagues have examined this problem in the phage lambda lysogeny maintenance promoter system in individual E. coli cells. Simultaneous single-cell measurements were taken of the phage repressor concentration as well as the number of individual messenger RNAs. A mathematical model was developed to describe stochastic activity in this promoter. The model showed that switching between promoter configurations occurred faster than the lifetime of mRNA molecules produced, and individual copies of the same gene functioned independently within same cell. Thus, simultaneous in vivo quantification of transcription factor and promoter activity followed by stochastic theoretical analysis is a tool that can provide new information on well-studied genetic circuits. Read more at Sepúlveda, L.A., et al. (2016) Science 351(6278):1218-1222.